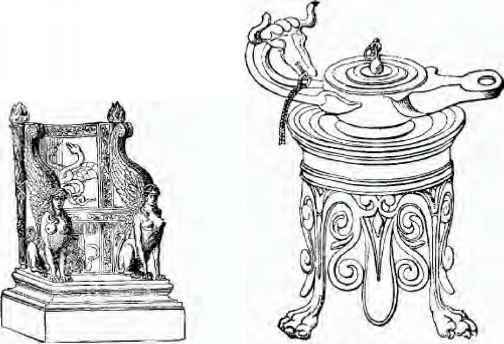 The Great Exhibition: Exhibitors and contemporary Cabinet Makers—Exhibition of 1862, London; 1867, Paris; and subsequently—Description of Illustrations— Fourdinois, Wright, and Mansfield—The South Kensington Museum—Revival of Marquetry—Comparison of Present Day with that of a Hundred Years ago— Mstheticism—Traditions—Trades-Unionism—The Arts and Crafts Exhibition Society—independence of Furniture—Present Fashions—Writers on Design—Modern Furniture in other Countries—Concluding Remarks. n the previous chapter attention has been called to the success of the National Exhibition in Paris of 1849; in the same year the competition of our manufacturers at Birmingham gave an impetus to Industrial Art in England, and there was about this time a general forward movement, with a desire for an International Exhibition on a grand scale. Articles advocating such a step appeared in newspapers and periodicals of the time, and, after much difficulty, and many delays, a committee for the promotion of this object was formed. This resulted in the appointment of a Royal Commission, and the Prince Consort, as President of this Commission, took the greatest personal interest in every arrangement for this great enterprise. Indeed, there can be no doubt, that the success which crowned the work was, in a great measure, due to his taste, patience, and excellent business capacity. 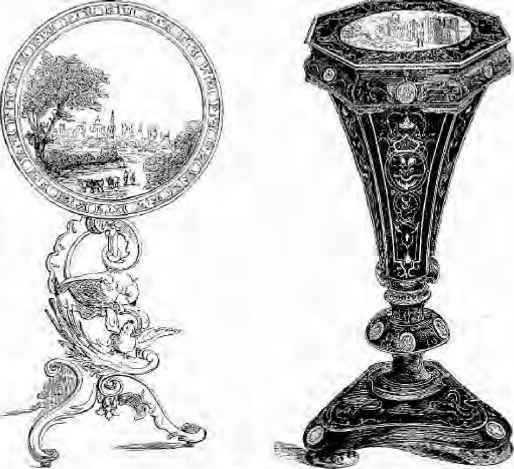 It is no part of our task to record all the details of an undertaking which, at the time, was a burning question of the day, but as we cannot but look upon this Exhibition of 1851 as one of the landmarks in the history of furniture, it is worth while to recall some particulars of its genesis and accomplishment. comprehensive of the whole world; and I offer myself to the public as their leader, if they are willing to assist in the undertaking." In Willie Wfiilrf, Lcrvi. 'j '.I, I■., Ii'jl. J'j^urui- LVKJjicdjjIl.i lIr.ii'i:aLttLi-(-iL by M„ Wfiltii, L'trln:, SV.'Uicrliliiil. To Mr. (afterwards Sir) Joseph Paxton, then head gardener to the Duke of Devonshire, the general idea of the famous glass and iron building is due. An enterprising firm of contractors. Messrs. Fox and Henderson, were entrusted with the work; a guarantee fund of some £230,000 was raised by public subscriptions; and the great Exhibition was opened by Her Majesty on the 1st of May, 1851. At a civic banquet in honour of the event, the Prince Consort very aptly described the object of the great experiment:—"The Exhibition of 1851 would afford a true test of the point of development at which the whole of mankind had arrived in this great task, and a new starting point from which all nations would be able to direct their further exertions." The number of exhibitors was some 17,000, of whom over 3,000 received prize and council medals; and the official catalogue, compiled by Mr. Scott Russell, the secretary, contains a great many particulars which are instructive reading, when we compare the work of many of the firms of manufacturers, whose exhibits are therein described, with their work of the present day. 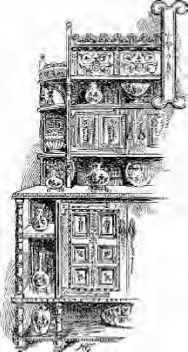 The Art Journal published a special volume, entitled "The Art Journal Illustrated Catalogue," with woodcuts of the more important exhibits, and, by the courtesy of the proprietors, a small selection is reproduced, which will give the reader an idea of the design of furniture, both in England and the chief Continental industrial centres at that time. With regard to the exhibits of English firms, of which these illustrations include examples, little requires to be said, in addition to the remarks already made in the preceding chapter, of their work previous to the Exhibition. 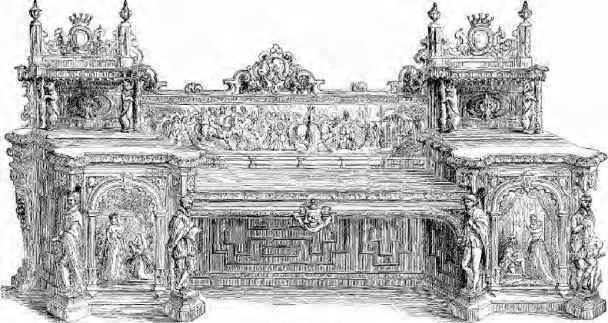 One of the illustrations, however, may be further alluded to, since the changes in form and character of the Pianoforte is of some importance in the consideration of the design of furniture. 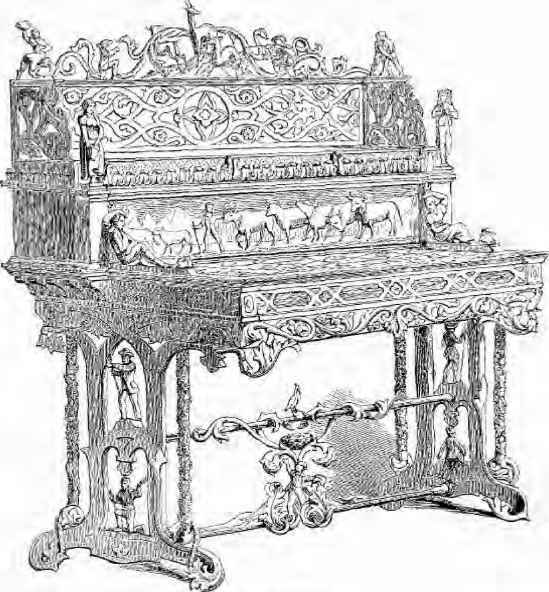 Messrs. Broadwood's Grand Pianoforte (illustrated) was a rich example of decorative woodwork in ebony and gold, and may be compared with the illustration on p. 172 of a harpsichord, which the Piano had replaced about 1767, and which at and since the time of the 1851 Exhibition supplies evidence of the increased attention devoted to decorative furniture. In the Appendix will be found a short notice of the different phases through which the ever-present piano has passed, from the virginal, or spinette—of which an illustration will be found in "A Sixteenth Century Room," in Chapter III.—down to the latest development of the decoration of the case of the instrument by leading artists of the present day. Mr. Rose, of Messrs. Broadwood, whose firm was established at this present address in 1732, has been good enough to supply the author with the particulars for this notice. 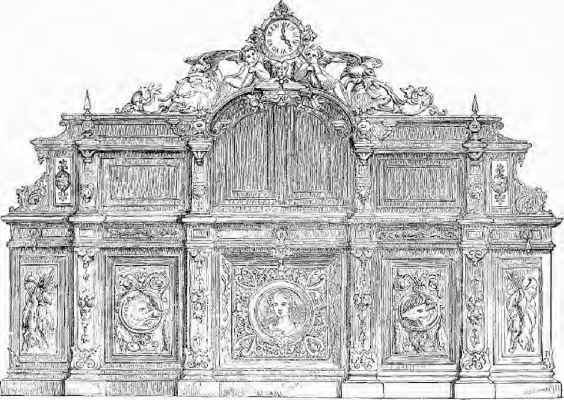 Other illustrations, taken from the exhibits of foreign cabinet makers, as well as those of our English manufacturers, have been selected, being fairly representative of the work of the time, rather than on account of their own intrinsic excellence. It will be seen from these illustrations that, so far as figure carving and composition are concerned, our foreign rivals, the Italians, Belgians, Austrians, and French, were far ahead of us. In mere construction and excellence of work we have ever been able to hold our own, and, so long as our designers have kept to beaten tracks, the effect is satisfactory. It is only when an attempt has been made to soar above the conventional, that the effort is not so successful. In looking over the list of exhibits, one finds evidence of the fickleness of fashion. The manufacture of decorative articles of furniture of papier-mache was then very extensive, and there are several specimens of this class of work, both by French and English firms. The drawing-room of 1850 to 1860 was apparently incomplete without occasional chairs, a screen with painted panel, a work table, or some small cabinet or casket of this decorative but somewhat flimsy material.